The Ethan Allen Homestead, located off Route 127 in Burlington, is a multi-use property rich in wildlife species. Tracks of raccoon, deer, gray squirrel, beaver, muskrat, red fox, and river otter can be found. Among many species of birds can be found in the park, including blue-gray gnatcatchers and northern harriers. With over 4 miles of trails, visitors can explore several habitats providing the opportunity to observe many wildlife species. As you walk along the Homestead’s elevated boardwalk through a cattail marsh, listen for early spring peepers and wood frogs, and keep an eye out for signs of beavers. 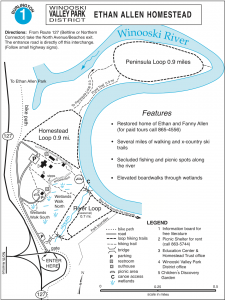 On the Peninsula Loop Trail that runs along the Winooski River, you may see tracks of river otter in the soft soil. Migrating waterfowl take advantage of the spring pools that form in the meadows, so bring along your binoculars for bird viewing. 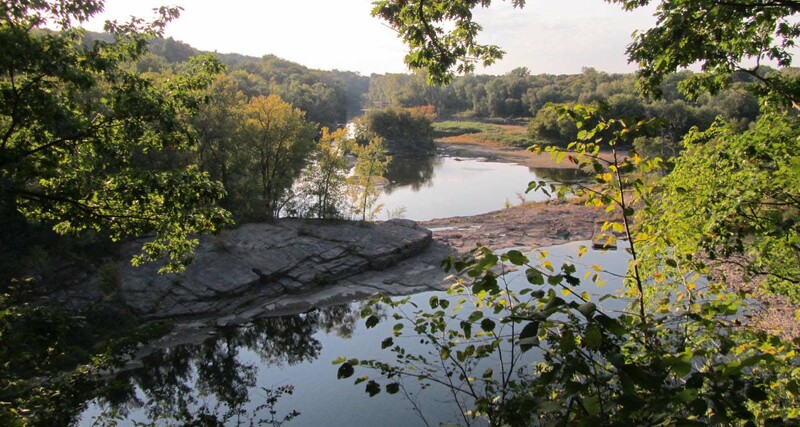 Bring a picnic lunch and enjoy a rest at one of the riverside picnic tables or in the open-air picnic shelter. 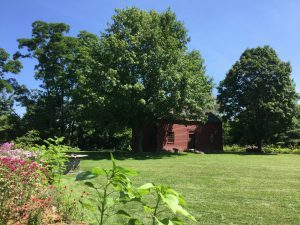 The Homestead is also the site of Ethan and Fanny Allen’s restored 1787 historic farmhouse. The Ethan Allen Homestead Museum offers tours of the house and information about Ethan Allen, his family, and early Vermont history. For more information visit www.ethanallenhomestead.org. 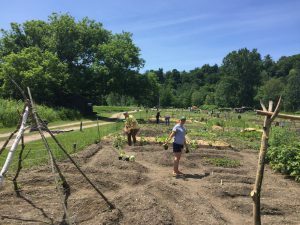 Several community gardens, including the Vermont Community Garden Network’s Teaching Garden and Association of Africans Living in Vermont New Farms For New Americans Community Gardens, are located at the Ethan Allen Homestead. Visit our Community Garden Partners page for information. The WVPD’s offices are located at the Ethan Allen Homestead. Stop by to say hello! Office hours are Monday – Friday, 8:00am – 4:00pm.